INTRODUCTION: The use of social media to disseminate major communications, particularly for campaigns related to days of health importance, is becoming much popular. The use of Twitter, Instagram, and Facebook is gaining an integral place in public life online with hashtag campaigns. OBJECTIVES: The objectives of this study were to assess the characteristics of hashtag campaigns related to health in social media and to compare three different campaigns in three commonly used social media platforms, namely, Twitter, Instagram, and Facebook. METHODOLOGY: This was a cross-sectional study which analyzed contents of three health-related campaigns in Instagram, Facebook, and Twitter. 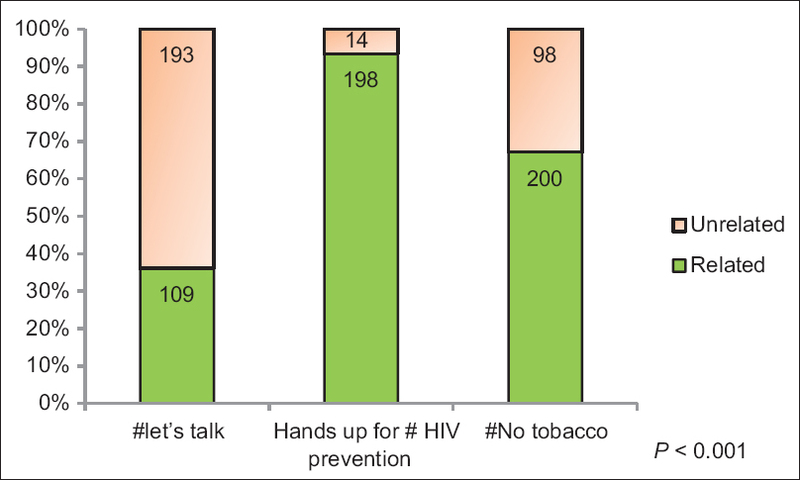 The campaigns were #let's talk (World Health day 2017), Hands up #HIV prevention (World AIDS day 2016), and #No tobacco (World No Tobacco Day 2017). Public posts related to each were searched from three platforms and assessed separately. Source, publicity, credibility, reach outs, and other characteristics were assessed among each campaign and comparison was also done among the three social media. RESULTS: Out of 812 posts, 507 (62.4%) were related to the study. Facebook posts were more related (67.33%), popular (45.05%), and authenticated (28.22%). Among the campaigns, # let's talk was more credible (96.33%) and authenticated (33.94%). Also in that, 57.79% from individual source and 79.82% were awareness related. CONCLUSION: Posts in social media related to hashtag campaigns are more credible, related, and less popular. These factors have to be considered for the campaigns to become an effective tool. Social media is an online communication system which facilitates interaction among people in various strata and thus diminishes the whole world to the size of any device. The most prominent part about this is that it influences the society at large and has a paramount place in people's minds. Globally, 50% of the population are using the Internet in some or the other way in the beginning of the year 2017 and, among them, 18.5% are active social media users. This proportion is increased by 21% compared to the year 2016. Most of the users were frequented in Facebook, Facebook Messenger followed by WhatsApp and YouTube. In India, 35% of the population were Internet users and 14% were active social media users out of the total population. An increase of 40% in active social media users was reported compared to the previous year. Nearly 48% of the Internet users access it at least once in every day. In India also, the same pattern of social media user ranks compared to global pattern. In India, the widely used social media platforms are Facebook, WhatsApp, Twitter, and Instagram. Currently, hashtag,, is used in popular social media such as Facebook, Twitter, Instagram, and YouTube (video-only platform). Hashtag is used as a tool in the social media for sharing contents and getting maximum popularity. Nowadays, health sector is using hashtag as a medium for propagating their agenda as health-related campaigns. People by themselves or through other parties contribute a lot to the media and share the information without considering the integrity of the information. This information may be derived from an individual or by an organization which is either shared or used indiscriminately. This random usage would create confusion among the public about the righteousness of the information and will eventually affect the effectiveness of the campaign. This study aimed to evaluate the pattern of posts which is shared via health-related campaigns and to assess the characteristics of the posts. In this regard, there were only a few studies,, which have been conducted worldwide using social media as an effective platform. (a) #let's talk (World Health day 2017) – World Health Day is celebrated on April 07 every year to mark the anniversary of the founding of the World Health Organization (WHO). The day provides us with a unique opportunity to mobilize action around a specific health topic of concern to people all over the world. The theme for 2017 was Depression: Let's talk with the aim of raising awareness on depression and the importance of seeking help early and subsequent early intervention. It is believed that stigma and lack of support for persons with mental disorders may prevent many from accessing the treatment they need to live healthy, productive lives. (b) hands up for #HIV prevention (World AIDS Day 2016) – AIDS presented such a horrendous effect since the early 1980s that the WHO designated a day to mark a global public health campaign to combat it on a war footing. Every year since 1988, December 01 is being observed as the World AIDS Day through which an awareness drive is being carried out globally to educate the masses. Every year, the World AIDS Day has a meaningful theme that becomes the lodestar in the mission to touch pertinent issues related to HIV/AIDS. This year's theme is “Hands up for #HIV prevention.” To mark this year's World AIDS Day, the UNAIDS has been asking people around the world to submit a photograph of a word or short phrase written on the palm of their hand summarizing what is required to strengthen HIV prevention efforts. (c) #No tobacco (World No Tobacco Day [WNTD] 2017) - WNTD is observed around the world every year on May 31. It is intended to encourage a 24-h period of abstinence from all forms of tobacco consumption around the globe. The day is further intended to draw attention to the widespread prevalence of tobacco use and to negative health effects. Each year, the WHO selects a theme for the day in order to create a more unified global message for WNTD. This theme then becomes the central component of the WHO's tobacco-related agenda for the following year. The theme for WNTD 2017 is “Tobacco – a threat to development” with a Hashtag of #No tobacco. Screenshots were used to capture posts. We fixed a target of a minimum of 300 recent posts in each campaign. Authentication (by identifying the blue tick mark at the end of the name). The data were entered into the Microsoft Excel software and analyzed using EpiInfo for frequencies, percentages, and associations. Two-tailed P < 0.05 was considered statistically significant. 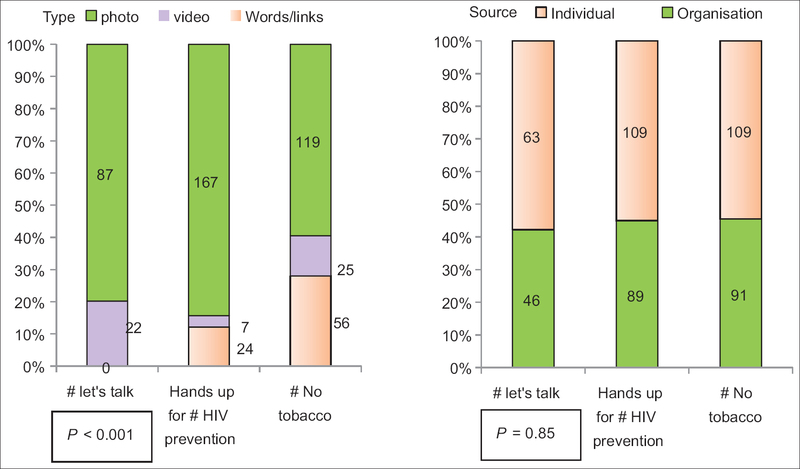 In our study, we intended to collect 300 posts from three campaigns (a minimum of 100 posts from each platform such as Facebook, Twitter, and Instagram) targeting a total of minimum 900 samples, but could only collect 812 samples (because of the less number of posts in Instagram for Hands up for #HIV prevention). The sample distribution among the three campaigns and platforms is depicted in [Figure 2]. In this study, out of the 812 posts collected, 305 (37.56%) were not related to the campaigns [Figure 3]. 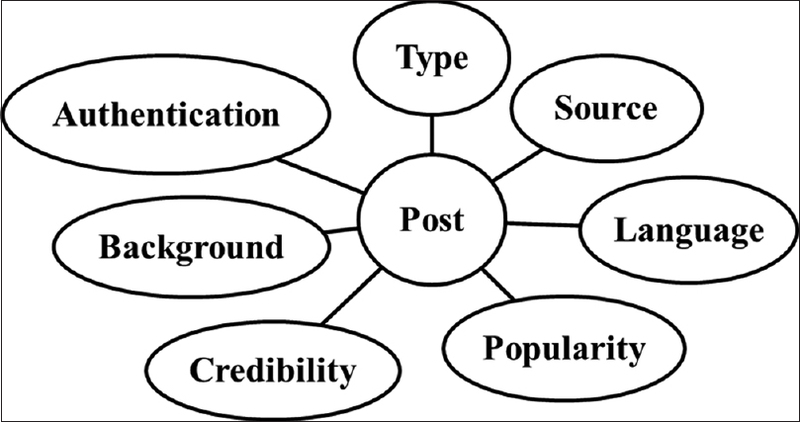 [Table 1] describes the characteristics of related posts among the samples. In the study, a majority of unrelated posts were from Twitter (39%). Facebook posts had maximum photo posts (42.6%), were more credible (38.5%) and authenticated (48.3%). 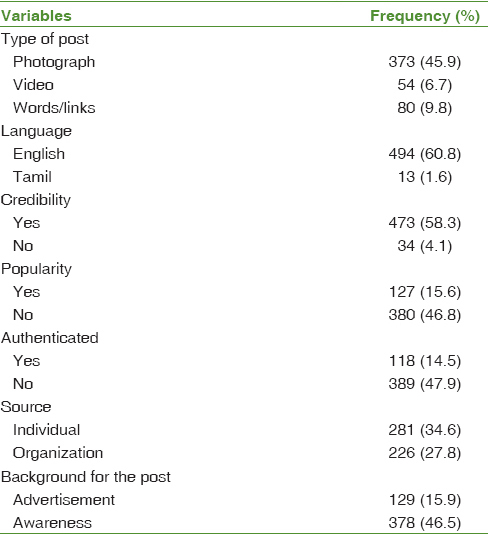 Maximum photo posts (42.6%), more credible (38.5%) and authenticated (48.3%) posts were shared on Facebook. Posts forwarded by individuals were higher compared to that by an organization on Facebook. More awareness-related posts were from Twitter media. 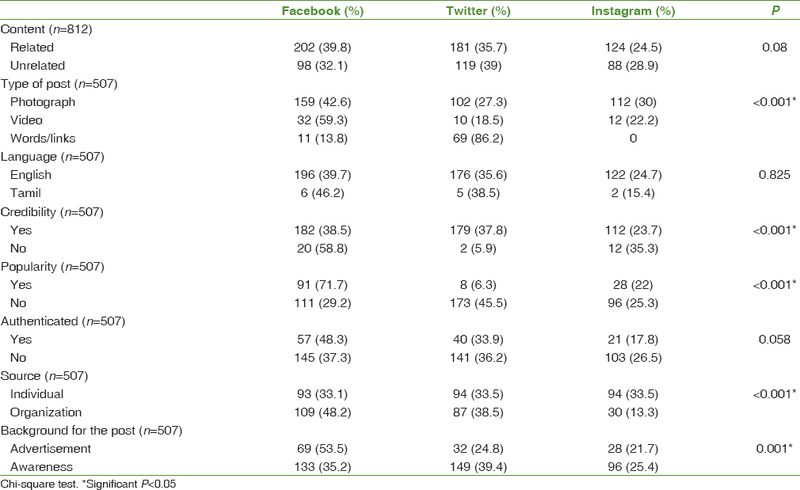 [Table 2] represents the pattern of posts specific to social media. 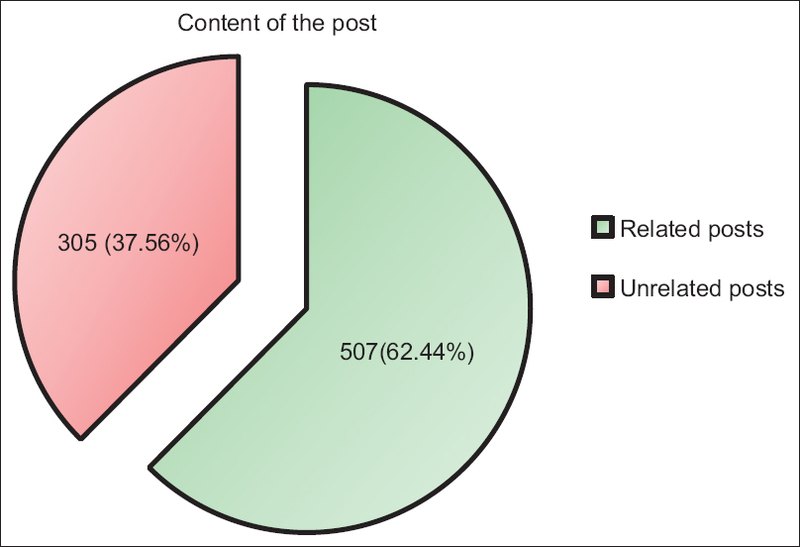 In the study, 67.3% of posts on Facebook were related to the purpose of the study. Out of the related posts, 78.71% were photographs, 97.03% were in English, 90.01% were credible, 45.05% were popular, 28.22% were authenticated, 46.04% were from an individual source, and 65.84% were awareness related. Among Twitter posts, 60.33% were related to the study. Among the related posts, 56.35% were photographs, 97.24% were in English, 98.89% were credible, 4.42% were popular, 22.09% were authenticated, 51.93% were from an individual source, and 82.32% were awareness related. Among the 212 Instagram posts, 58.49% were related to the study. In the related posts, 90.32% were photographs and 98.39% were in English. Among the studied posts, 90.32% posts were credible and 22.58% were popular. Among the Instagram posts, 16.94% were authenticated posts, 75.81% were from an individual source, and 77.42% posts were to create awareness among readers. Out of the 812 posts, 507 posts were related to the campaigns. [Figure 4], [Figure 5], [Figure 6], [Figure 7], [Figure 8] depicts the distribution of posts among the campaigns. In this study, posts related to health campaigns are studied which presented a different view from any of the previous studies done on social media. Fung et al. assessed differences between Instagram and Pinterest in relaying photographic information regarding zika virus and suggested that Pinterest and Instagram serve as relatively similar platforms for the purpose of zika virus prevention communication. Seltzer et al. compared the content on Instagram and Flickr to identify discourse about Ebola and found that Instagram images were mainly funny images. Flickr images primarily depicted health-care workers and other professionals. A similar study conducted on the patterns and characteristics of posts related to selected health issues (#dengue, #dengue virus, #zika, and #zika virus) in Facebook, Twitter, and Instagram showed that Facebook posts were having higher popularity and were having more posts from verified accounts. They also found that posts related to research were more in Twitter. In this study, out of the 812 posts collected, 305 (37.56%) were unrelated to the study. The unrelatedness of post is due to the fact that, when a particular hashtag is trending in social media, people use it to gain attention and popularity. In the study, photo posts were more in Facebook and other social media, because according to studies, photo posts get more engagement than links, videos, or text-based updates; they actually account for 93% of the most engaging posts on Facebook. Furthermore, photographs get 53% more likes, 104% get more comments, and 84% get more click-throughs on links than text-based posts. Another study showed that, photo posts get 120% more engagement than the average post, and photo albums actually get 180% more engagement. In the study, most of the posts in the social media were credible 473 (93.29%). Credibility is defined as “the quality of being trustworthy.” “The greatest enemy of knowledge is not ignorance; it is the illusion of knowledge,” said Stephen Hawking. In communication research, information credibility has three parts, namely message credibility, source credibility, and media credibility. Now, each social medium ensures the credibility of their accounts; for example, Twitter has a set of verified accounts. These accounts have a blue badge on their profiles. According to Twitter, “the verified badge helps users discover high-quality sources of information and trust that a legitimate source is authoring the account's tweets.” The result in this study is similar to a study done about selected disease pattern in social media where 80.5% of posts were credible. In a study done on health-related tweets, it was found that over half of the tweets (320/625, 51.2%) in the sample were not supported by medical evidence. Analysis of tweets by account type showed that government institutes share most of evidence-based medical tweets (80%), followed by physicians (61.7%), and dieticians (41.6%). Over half of the health-related tweets from nonofficial health institutes (68.1% [169/248]) and dietician accounts (58.4% [59/10]) were false. In the study, most of the posts were awareness related rather than advertisement, which goes along with the study, i.e., about the health-related campaigns. In this study, a majority (63.3%) of unrelated posts were for the #let's talk campaign than the other campaigns. This may be due to the similarity of this hashtag and that for spoken language courses, information accounts, and student counseling advertisements. 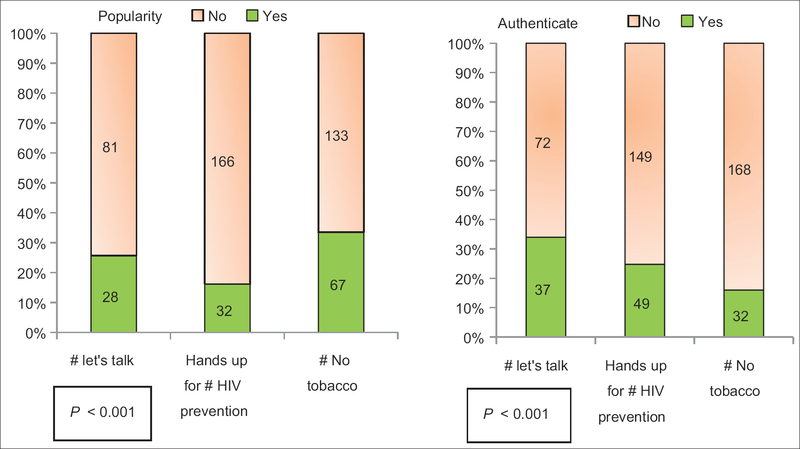 Hands up for #HIV prevention campaign had the majority (44.8%) of photo posts than the others. 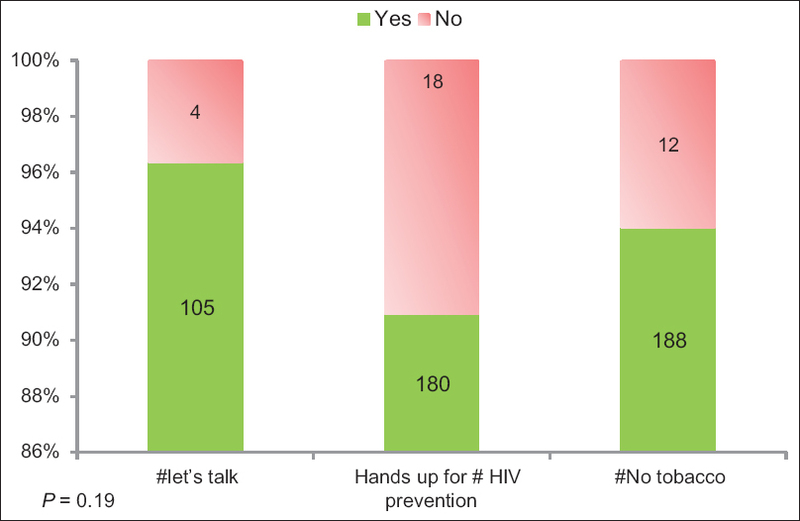 The reason can be because UNAIDS has been asking people around the world to submit a photograph of a word or short phrase written on the palm of their hand summarizing what is required to strengthen HIV prevention efforts to strengthen the campaign. 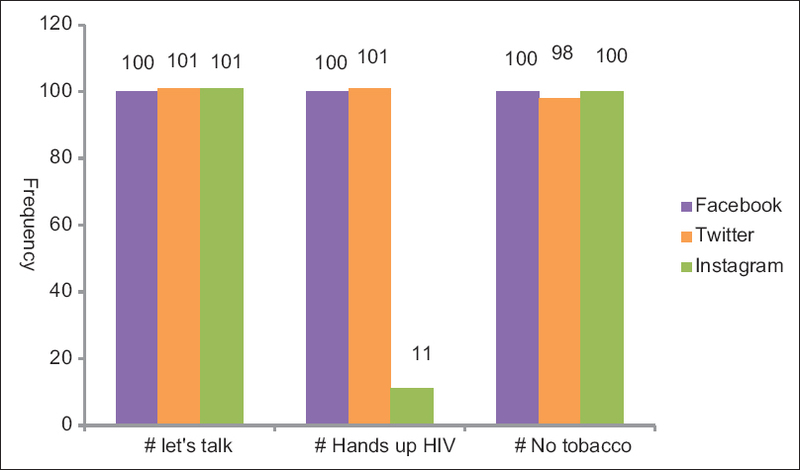 Hands up for #HIV prevention campaign had the maximum (43.7%) unpopular posts among the others. This result can be justified as the disease itself is stigmatized and discriminated which makes people reluctant to share or like the posts. This is evident from a study done among the general population where about one-third thought that one could get infected by merely touching an HIV-positive individual. Approximately 45% stated that they would dismiss their maid on finding out her HIV-positive status. #No tobacco campaign had the maximum (43.2%) unauthenticated posts compared to others. The reason can be due to the increased post sharing by insignificant people who supports anti-tobacco campaigns along with verified accounts. The quality of these hashtag campaigns can be improved by the responsible usage of the people and improvement of features for maintaining the various aspects of quality in social media platforms besides eliminating fake profiles. In this study, out of the 812 posts collected, 305 (37.56%) were unrelated to the study. Among the posts, majority of the posts were in English, credible, unpopular, unauthenticated, were from individual source, awareness related, and photographs. In our study, it is found that Facebook posts were more related, authenticated, popular, and verified. Twitter posts were unpopular and more related to awareness creation. Instagram posts were least authenticated and credible. Hashtag campaign in social media is the recent trend of spreading the health information, especially where improvement in health literacy is targeted. This aspect is used by many major health organizations to spread the awareness. Substantial steps should be put forward to reach the people about the health campaigns, thereby effective results can be achieved. The success of the posts depends on its relatedness, credibility, authentication, and message-conveying power. The concerned people should make sure of the aptness in terms of content and audience. Social media platforms should take steps to improve the above-mentioned characteristics of the posts to make the health campaigns successful. The study included campaigns which came into being in different time periods and may lead to the alteration of results. Languages other than English and Tamil have been excluded from the study. Individualized decisions may have occurred during interpretations of posts which may alter the results. Other platforms such as YouTube (assessment of hashtag-related video posts required more time) were not considered. We thank the faculty of Department of Community Medicine for their help and encouragement. U.S Census Bureau and United Nations. Global Web Index. Available from: http://www.globalwebindex.net/. [Last accessed on 2017 Nov 21]. The Register. “ Hashtag Added to OED – But # isn't a Hash, Pound, Nor Number Sign” 2014 June 13. The Oxford English dictionary. Oxford: Oxford University Press; 2014. Fung IC, Blankenship EB, Goff ME, Mullican LA, Chan KC, Saroha N, et al. Zika-virus-related photo sharing on Pinterest and Instagram. Disaster Med Public Health Prep 2017;11:656-9. Seltzer EK, Jean NS, Kramer-Golinkoff E, Asch DA, Merchant RM. The content of social media's shared images about Ebola: A retrospective study. Public Health 2015;129:1273-7. Britto DR, George N, Prabhu R, Murali KJ, Nethaji V, Shree J. Hashtag usage and its pattern on selected health problems in social media. Int J Med Sci Public Health 2018;7:203-8. World Health Organization. World Health Day 7th April 2017; 2017. Available from: http://www.who.int/campaigns/world-health-day/2017/en/. [Last accessed on 2017 Nov 06]. Joint United Nations Programme on HIV/AIDS (UNAIDS); 2016. Available from: http://www.unaids.org/sites/default/files/media_asset/WAD2016-brochure_en.pd. [Last accessed on 2017 Nov 07]. World Health Organization. World No Tobacco Day 2010. Geneva: http://www.who.int/campaigns/no-tobacco-day/2017/event/en. [Last accessed on 2017 Nov 07]. Social Timing Infographics from Dan Zarrella, KISSmetrics, Bit.ly and Argyle Social. Available from: https://www.blog.bufferapp.com/best-time-to-tweet-post-to-Facebook-send-emails-publish-blogposts. [Last accessed on 2017 Nov 06]. Kristin Long. Infographic: Photo Posts get 120% more Engagement on Facebook. Available from: https://www.ragan.com/Main/Articles/Infographic_Photo_posts_get_120_more_engagement_on_46290.aspx. [Last accessed on 2017 Nov 06]. Pedersen ER, Kurz J. Using Facebook for health-related research study recruitment and program delivery. Curr Opin Psychol 2016;9:38-43. Kim SU, Syn SY. Credibility and usefulness of health information on Facebook: A survey study with US college students. Info Res Int Electron J 2016;21:paper727. Metzger MJ, Flanagin AJ, Eyal K, Lemus DR, McCann RM. Credibility for the 21st century: Integrating perspectives on source, message, and media credibility in the contemporary media environment. Ann Int Commun Assoc 2003;27:293-335. Alnemer KA, Alhuzaim WM, Alnemer AA, Alharbi BB, Bawazir AS, Barayyan OR, et al. Are health-related tweets evidence based? Review and analysis of health-related tweets on twitter. J Med Internet Res 2015;17:e246. Unnikrishnan B, Mithra PP, Rekha T, Rashmi B. Awareness and attitude of the general public toward HIV/AIDS in coastal Karnataka. Indian J Community Med 2010;35:142-6.